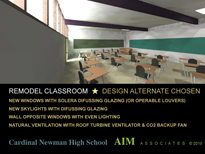 The extensive remodel of the Cardinal Newman High School to transform it into a High Performance School included upgrading the structure for seismic resistance, building envelope, heating, cooling and ventilation, and lighting controls. The existing buildings were built in 19060s but our life cycle cost analysis of alternatives upgrades led to a cost effective HPS design solution. 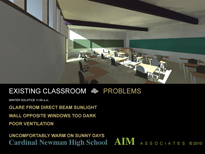 The Daylighting shall be used as the primary lighting source for all classrooms. The existing windows will be replaced with high performance glazing and skylights will be added to provide good daylighting even on days with overcast sky conditions. The new high performance glazing will prevent excessive heat gain or heat loss. 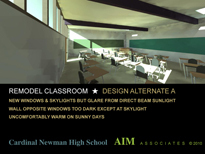 The daylighting shall be introduced with minimal direct beam solar radiation and glare because roof overhangs and light shelves are being added. Diffusing shades shall be used to control daylight glare and for darkening the rooms for audiovisual presentations. The top lighting is being added to adequately light the walls and chalk board/marker boards deep within the classrooms. 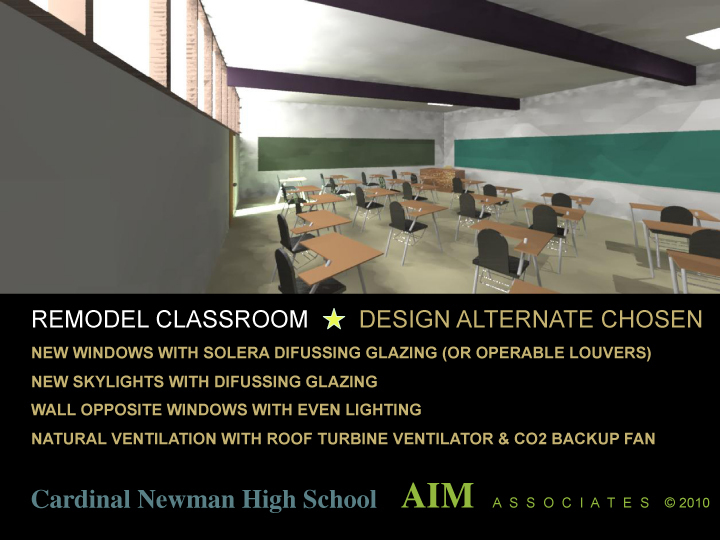 The daylighting will then be harvested by a automatic dimming system that will measure the lighting levels in the classrooms and dim the electric lighting when the daylighting is adequate. The teacher will be able to override the system when special lighting or darkening of the room is required. The optimization of the building envelope was done by running computer energy simulations with Energy 10. This was started early in the design process as it must be to have a synergistic effect on the design decisions. The daylighting was optimized by running computer daylighting simulations using Radiance software. The heating and ventilation system energy simulations were done with Energy Pro software. The energy that will be saved compared to the energy use of the existing building is 51% less electricity for lifghting, 63% less gas for heating, 58% less total energy. Add skylights to interior half of room with high performance glazing. A light diffusing, low brightness lens will be added to avoid visually harmful direct sun beam and glare. A room darkening shade or louver will allow audio visual presentations. Add a roof overhang over south facing windows to protect against visually harmful direct sun beam light. Add a light shelf to south facing windows to protect against visually harmful direct sun beam light while reflecting daylight up to the ceiling for deeper penetration into the classroom. Add room darkening shades to all windows to allow audio visual presentations. 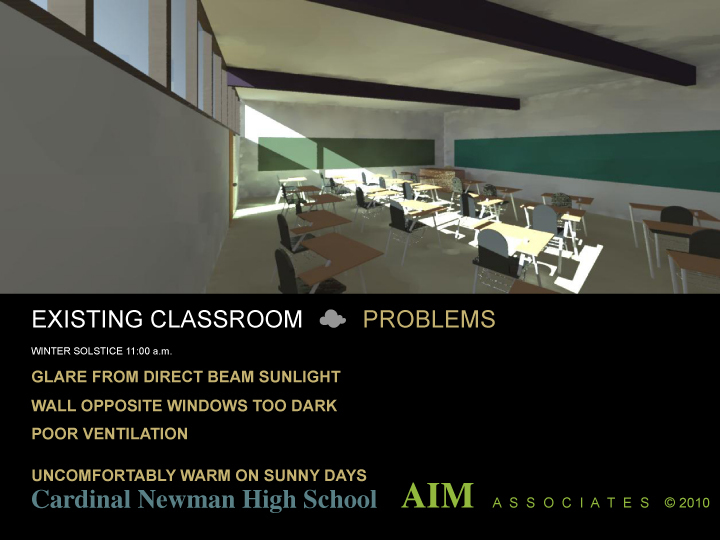 Add automatic dimming controls to the existing electric light fixtures that will measure the lighting levels in the classrooms and dim the electric lighting when the daylighting is adequate. Operable windows oriented to capture the prevailing breeze. Ceiling operable vent to allow hot air to be vented passively. Night cooling ventilation without using fan energy will be utilized with the above two passive ventilation openings. Indoor air quality and energy efficiency will be assured by carbon dioxide sensors that will turn on fan ventilation when needed but only when needed. Replace existing windows with single glazed dark gray film on glass in aluminum storefront frames with windows with double clear glazed with Low-E2 argon filled glass in fiberglass frames. Skylight double clear glazed with Low-E2 argon filled glass in and thermally broken aluminum frames. Add roof insulation to upgrade from R-10 to R-30 insulation. Replace existing mineral cap built-up roof with an EPA certified Cool Roof. Add a roof overhang and a light shelf over south facing windows to protect against solar heat gain in the summer. Cellulose insulation blown into exterior walls. Replace outdated, oversized, boiler with two modular, condensing high efficiency boiler. Replace outdated, classroom convector units with high efficiency units controlled to allow natural ventilation controlled by carbon dioxide sensors that will turn on convector fan ventilation when needed but only when needed. No mechanical cooling will be needed because the building envelope is so efficient that night ventilation cooling will be adequate.